Yeah, but: Transit pr0n is an unusual sub-genre. 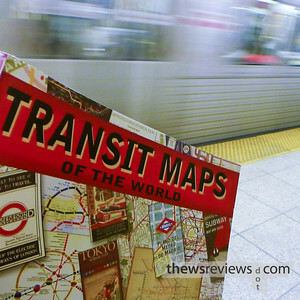 The Long Version: Transit Maps of the World isn't a book with a gripping narrative that you'll want to read from cover to cover in one sitting, but it's an interesting collection of information just the same. As the name implies, it compiles almost 200 different subway systems. I can't confirm that it includes every system in the world, but it sure is an awful lot of them. The book is divided into sections. The introduction provides an overview on the general evolution of mass-transit rail, and the way those systems have been depicted as maps evolved into diagrams. From there it delves into specific systems, which are split into token groupings based on the age and complexity of the systems. The grand networks, such as Berlin, London, and New York, are all covered extensively. 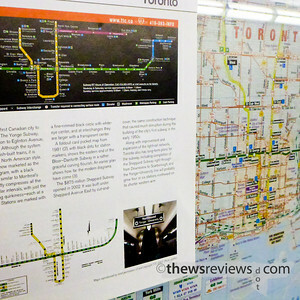 Smaller and newer networks receive proportionate attention: Hong Kong and Mexico city get two pages each; Toronto and Los Angeles get one page each; upstart and little light-rail surface networks are grouped in the back with just a paragraph to describe the system and its accompanying map. It should go without saying that this is a book about the transit maps that each system has generated, and while that unavoidably includes some information on the history and contemporary operation of the different networks, the focus remains on the design and implementation of its wayfinding. A certain amount of repetition is unavoidable – similarity among the designs indicates their broad success – which makes this a great book to pick up, get involved in, and then put down until next time. 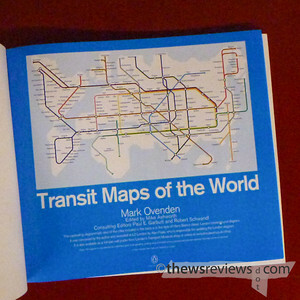 Transit Maps of the World becomes a launching point. It, and a couple of trips to New York City, have completely rewritten my understanding of Toronto's own two-and-two-halfs subway network. It's led me to spend several happy afternoons learning more about different subway systems (check Joseph Brennan's awesome list of abandoned subway stations in NYC) instead of getting actual work done, and I've even started a little personal project to play with some ideas for Toronto's subway map as well. Part of planning a recent trip to New York City involved finding the best subway station to get to from the place where the bus would drop me off. I was looking at the very geographic MTA map, but when I shifted to Google's view of the city I discovered that the actual distances were different enough to make me choose a better route. Subway maps invariably distort geography, but instead of being a flaw, it may simply reflect the different spatial relationships within the city that mass transit creates. There's a big difference between a map and a diagram. Depicting a transit network balances the complexities of presenting information in a way that's simplified enough to be comprehensible, but accurate enough to be useful. How that problem has been solved around the world and over the past century is ultimately what Transit Maps of the World is all about.